Orbiting at a thousand feet over the bay at Pensacola, I could see the USS Lexington moored to the dock about three miles away. The CAF Wildcat was the lead plane of our two-plane flight, and looking back, I could see Col Bob Schneider in loose formation in his own Grumman TBM Avenger. We were waiting to be called in to make the last fly-by and carrier approaches to the Lexington by World War II combat aircraft, as part of her decommissioning ceremonies that morning. The last of the big fleet aircraft carriers to have seen combat in World War II, the Lexington was commissioned as CV-16 in September, 1942, part of the Essex class, and was named after the original "Lady Lex," which was sunk during the Battle of the Coral Sea, in May, 1942. Since the early 1960s, the "Lex" had served as a training carrier, and most, if not all of today's naval aviators, had made their first carrier "trap" (Navy slang for an arrested land-mg) on her historic flight deck. Bob and I had agreed after flying a practice mission the day before, that a modified airshow "photo pass" would best display the two planes to the crowd of dignitaries and former crewmembers seated on the dock. This requited coming in low and fast, then pulling up into an arcing turn, with the wings of the aircraft banked as nearly vertical as possible, giving the crowd a view of the top of the planes as we flew by. Practice had shown that if the pass was flown just below the top of the radar mast on the carrier and right down the old straight flight deck, it looked just right to those at dockside. "Wildcat flight, you are cleared in - Buster!" came our signal from the tower at NAS Pensacola's Sherman Field to start our run in for the pass. As I increased the power and dropped the nose of the Wildcat, the airspeed rose to about 220 knots. Levelling off 50 feet above the quiet waters of the bay, the stern of the ship seemed to rush at me as I began a turn to the right. Judging the right point and time, up we went, smoke on, tightening the turn so as to pass right over the old flight deck. At the top of the arc, the big radar antenna on the main mast went past the top of the canopy - less than a wingspan away - as I continued the turn and began to roll back level. Looking back, I saw the TBM just rolling out of his photo pass, and as briefed, we turned back to our orbit area over the bay, to wait for our final carrier approach. "Wildcat and TBM, I have a signal for you from the ship" came the call from the tower. "Go ahead, Sherman Tower" I acknowledged. "Signal is Bravo Zulu, over." "This is the Wildcat, roger, Bravo Zulu, understand, thanks." We had just been given the highest praise in the Navy's signal language for a maneuver well executed. It was a very special feeling to have helped say goodbye in this way to a piece of our American naval aviation heritage. Copyright © 1992 by the Confederate Air Force, Inc. and Randy Wilson. All rights reserved. 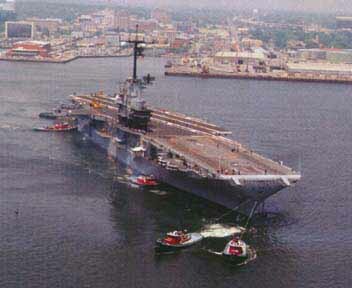 The USS Lexington (AVT-16) on May 2, 1991 being towed to NAS Pensacola for her decommissioning. This was the ship's last "underway" as a commissioned ship. See the article Bravo Zulu for more information.